Last Summer I made a minigame called Wizard Conflict for iOS. It's based on a game called Wizard Battle made by Foppy. Wizard Battle is a "one switch" game - the controls consist of only one button, making it playable for impaired people. The downside to this is that it tires your fingers out in competitive play. I figured that a touchscreen variant of the game would be an improvement for a mobile device. The gameplay is simple - you spawn units from your side of the screen. 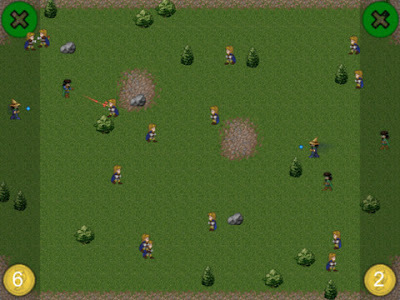 The starting objective is to get your units past your enemy for bonus points. To win you need to get a wizard unit past the opponent, usually through cunning or by leveraging a points advantage. The game was written mostly in C++ using a simple engine I made. SDL and CocosDenshion were used for context creation and audio, and OpenGL for graphics. Most of the assets have a Creative Commons license, and the rest I made using Blender and masterful programmer artistry. It has a few good reviews and one bad one from somebody who found it too tricky. When I update it I'll add a tutorial level, plus some new units and drag-and-drop spells. It also needs releasing for iPhone - that comes as soon as I can get my hands on one to test it on. Cool stuff; I dig it.